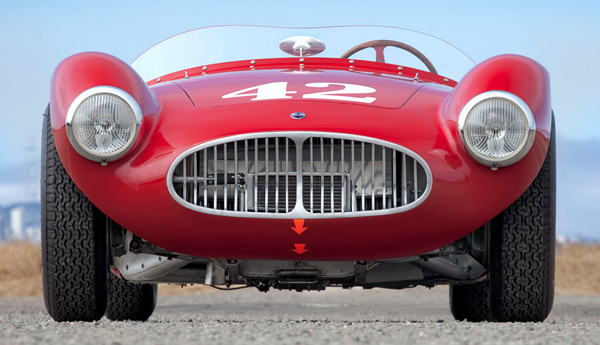 Chassis 2053 was delivered by the Maserati factory to U.S. Maserati distributor and team owner Tony Pompeo, through his entity, P. Ducati Motors, in 1953. Fascinatingly, 2053 was photographed doing some demonstration laps during the SCCA Nationals at Thompson Raceway on December 12, 1953, in the hands of Juan Manuel Fangio himself, in the famous and familiar drift position. During its display at the International Motor Sports Show, in New York, Pompeo sold the car to its first “civilian” owner, Don McKnought, early in 1954, whereupon he entered it into the Sebring 12 Hours. However, he DNF’d after 67 laps. Extensively raced since, it suffered an accident at the Brynfan Tyddyn Road Races in Pennsylvania and was sold to Fritz Koster in 1955. Koster also owned A6GCS/53 chassis 2039 and, therefore, raced 2053 very little. In 1958, he sold 2053 to James and Ben Diaz. These brothers, after racing it briefly in its original configuration, refurbished the car, sold engine 2053 to Karl Ludvigsen, installed a Chevrolet V-8 engine, and returned the Maserati to the race track for a few events, where the car did well. In this configuration, it was purchased by Gus Buscham in 1961, who, in turn, sold it to Louis Casazza three years later. Casazza retained ownership of the car for almost 25 years, before selling it to noted Maserati expert and owner of MIE International, Frank Mandarano, in 1989. Mandarano commissioned the creation of a reproduction Maserati engine with high performance specification, which was stamped 2053 to match the chassis. Mandarano also endeavored to return the car back to its original look by removing a faired-in headrest that it had acquired along the way, as well as restoring other features.